Today we’ve got something that’s more of a completionist piece than anything else. It’s the original article from the month the old Scorcha model was released (White Dwarf 220). Well, technically it was the new scorcha model as the original was released in 1989/1990 but you get the idea! 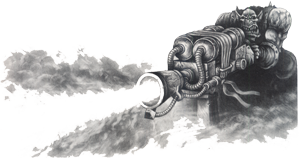 This article contains both the 2nd edition Warhammer 40,000 rules for the Scorcha and the Gorkamorka rules for it. The latter seems a bit odd as the issue was well into 1998 and the rules for Scorchas have always been in Da Roolz. Slow month for content, maybe..? Anyway, there’s a download link below. It’s about 11 MB – probably not an issue but a heads-up for anyone accessing the file from a slower data connection just in case. This entry was posted on Thursday, March 19th, 2015 at 20:41	and is filed under General. You can follow any responses to this entry through the RSS 2.0 feed. You can leave a response, or trackback from your own site.